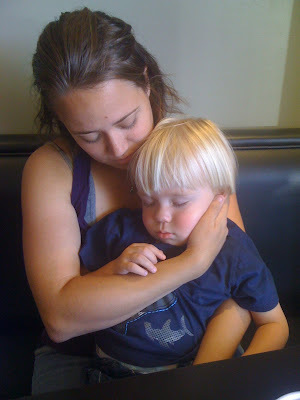 He actually fell asleep in a restaurant! GASP. What did we do? We ate SUPER SLOW and with no corralling and/or spilling of beverages. It was amazing. Poor buddy. He had a bit of a rough week. This week I started back to work (the part to the time - love it!). It was (being honest here) nice to be in the office. With The Grownups. I had forgotten how many acronyms there are in the working world (or at least my working world). As I've mentioned, I am filling in for a former team member while she is on maternity leave. Even though it's been over a year, I can't express to you how creepy it was to login in and, after - oh - about 10 seconds, remember how to do just about everything (technically speaking). F3, /am, O, F7. Took me about 5 seconds to remember that "shortcut" in our ad tracking system. My fingers just KNEW. Sometimes I can't remember what I had for breakfast mere hours before, but, apparently, I can recall with clarity certain processes I was sure I wouldn't (want to) remember! awww! Poor little guy! Glad you're liking being back! I heard Aud left...or is leaving.. or something? What?! Random.